The primary aspect that attracted me to Her was my own rather time consuming addiction and dedication to technology. I have to admit that I am a slave to a certain fruit named corporation, owning a MacBook Pro, iPad Air, iPod Touch and iPhone 5s combined with numerous other electrical devices that satisfy my need for technological efficiency and innovation. There was something undoubtedly unsettling for me about the film’s trailer, a mixture of interest and admiration for the type of futuristic machinery on display, combined with an eery caution at the way in which writer and director Spike Jonze has envisioned the future relationship between humans and artificial intelligence. Joaquin Phoenix stars as protagonist Theodore Twombly, a professional letter writer whom we learn is in the midst of a divorce settlement and very, very alone. The film appears to be set in the near distant future in a society that is even more technology dependent than ours currently is, with Theodore and almost every other character shown to be sporting voice activated ear pieces from which they can access email, music, pretty much everything we are used to in a contemporary smartphone. The one thing that these seemingly extraordinary devices appear to lack is any kind of human quality, with voices akin to the automated tones of Siri, that is, until Theodore purchases the new state of the art operating system that boasts an experience unlike any other. It is at this point that we meet (or, more correctly, hear) Samantha, the digital personality created to best suit Theodore’s needs and preferences. What follows is perhaps one the most modern love stories you are likely to witness, as Theodore and Samantha’s relationship goes from electronic, to platonic, to romantic, to, yes, even sexual. What is remarkable about the relationship, and the film in general, is that this union, in context, does not come across as particularly strange until the audience begin to be guided by other characters in the narrative. Though he can only hear her, though he knows she is an artificial construct, Theodore’s chemistry and affection for Samantha (voiced by Scarlett Johansson) feels authentic and jarringly comfortable. Only when his ex-wife, for example, questions the strangeness of the partnership are the audience brought out of the technological bubble that the smooth tone of Samantha’s voice creates for us. This is an incredibly effective technique to have achieved by the filmmakers, as it completely validates the point that this advanced, intelligent machinery can fill a deeply personal void in ones life. 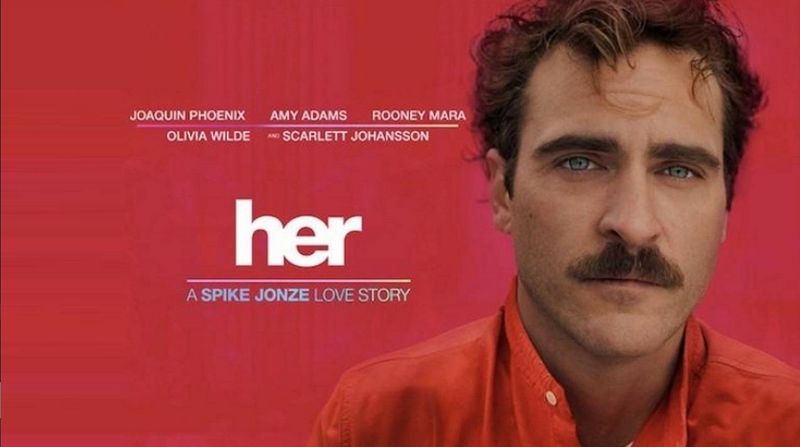 The performances given in Her are integral to the success of the narrative, and Joaquin Phoenix is the perfect choice for Theodore, a character that, whilst shy and introverted, has an undeniable charm and charisma. The audience have to accept that the man can be capable of a real, human relationship as well as the virtual one we see him in, and Phoenix gives enough social interaction and ease combined with moments of pure vulnerability to make that aspect of Theodore’s character believable. The voice casting of Samantha is a story with a little more history, Samantha Morton having been the original choice and the film completed before Spike Jonze had a last minute change of heart and recast in favour of Scarlett Johansson. Jonze explains his decision, stating that “Samantha [Morton] was really involved in giving Joaquin a lot … to work from. And then when we got into editing, we realised that what Samantha and I had done together wasn’t working for what the character needed”, which seems like a very hasty and harsh decision on Morton’s part. Having said that, Johansson is very enjoyable in the role and brings a certain calmness and sympathy to Samantha’s voice that really matches and connects with the emotions of Theodore’s situation. It also shines a light on the impressive way in which Johansson was able to blend her version of the character to Phoenix’s actions, having had Morton’s voice to react to for the entire shoot. Personally, I felt that Amy Adams was underused in the role of Theodore’s, seemingly only, human friend Amy. There was a chemistry there that I would have liked to have seen expanded, especially towards the end of the picture, but I also respect the bravery and vision of Jonze in his decision to anchor most of the film solely with Phoenix and an ethereal voice. The more time spent with just Theodore and Samantha, the less incredulous and cynical the audience become with regards to their odd arrangement. Overall, Her touches on all the classic themes like love, depression, divorce, and insecurity but does so in such a refreshingly unique context that an experience verging on the unforgettable is had. Undeniably melancholy and self-reflective, the film is also surprisingly humorous and off beat in its treatment of its characters and its universe. Anchored by an understated yet powerful performance from Joaquin Phoenix, who is tasked with guiding the audience though the majority of the picture alone, Her never becomes dull or disengaging. Yes, it is certainly science-fiction, but it leaves one to wonder just how much fiction will the film be able to boast when returned to in one hundred years time? I’m fascinated by this. I really can’t wait to see it. Really interesting reading about Samantha Morton. I’m extremely impressed with your writing skills and also with the layout onn your blog.